From drawing people’s attention to your business to reinforcing your brand, the benefits of exterior signage are manifold. Acting as an effective branding and advertisement tool, outdoor signs for business can help people make aware of your business, entice them to know more about your offerings and even buy from you. With a professional sign, you can help differentiate your business from the competition and stay a step ahead of them. But your job doesn’t stop at just having an exterior sign. They could get damaged by storms, or even crack, fade, warp or break over time. 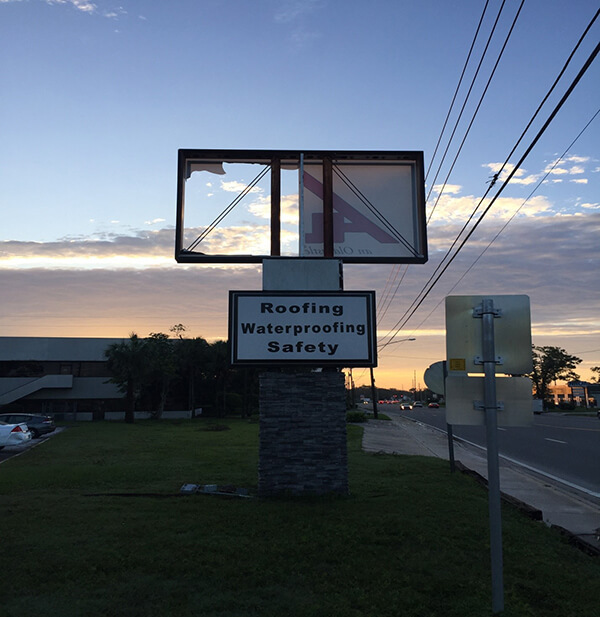 Taking timely storm damage repair steps or fixing other damages to your exterior signage is crucial to uphold a professional image for your business and show how serious you are about every aspect of it. 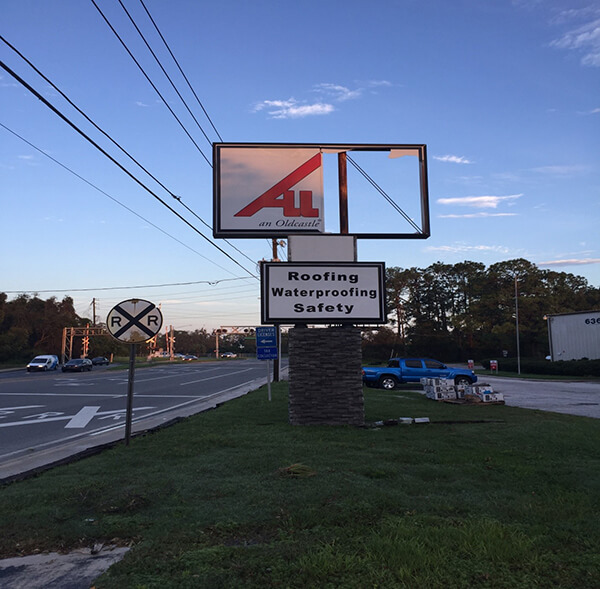 This time, Citrus Sign Studio helped Allied Building Products Corp. repair their exterior signage that was damaged by Hurricane Irma. 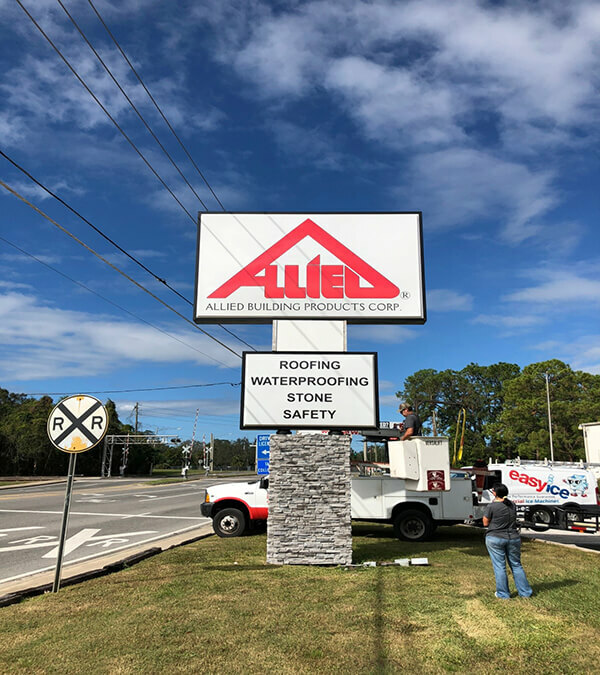 Allied Building Products Corp. is a distributor of siding, roofing, waterproofing, windows, skylights, doors, interior products, tools and much more to commercial, residential and industrial building contractors. Having started its journey in 1950 as a small family-operated business in the domain of custom sheet metal fabrication and roofing, Allied today has grown into a company with more than 200 locations coast to coast, which employs 3,100+ individuals and has a huge fleet of more than 2,785 vehicles. 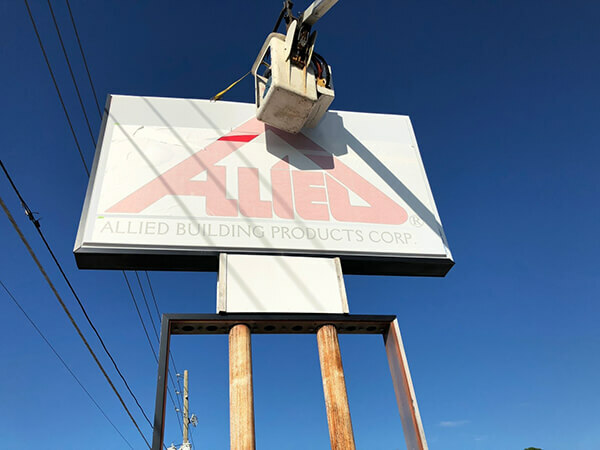 Instead of outdoor signs for business with a flat face, Allied Building Products Corp. had pan faces on its huge pylon sign. When Hurricane Irma tore through Orlando, the pan face of Allied’s exterior signs were blown out. Citrus Sign Studio was called for storm damage repair. Our first step was an onsite survey of the damaged exterior signage to find the exact size of the pan face. We needed the precise measurements to make the new one fit perfectly into the existing pylon frame. We found the pan face to be 14.5’ x 8.5’ in dimension. For storm damage repair, we needed to create a brand new pan face sign that matched the exact dimensions of the torn one. We used custom 3M graphics to fabricate the new pan face and ensured it was eye-catching and stood out from the other nearby outdoor signs for businesses. Once we had the exterior signage ready, it was time for the installation. This is the last step before revealing your business sign to the world. 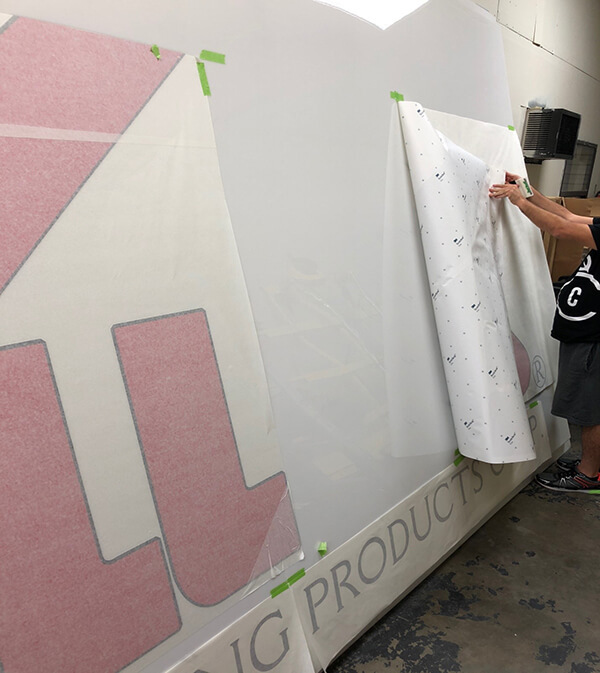 Citrus Sign Studio always maintains its commitment to the highest standards of quality for any job it takes – from the initial stages right to the finish, and it was no different for Allied Building Products. 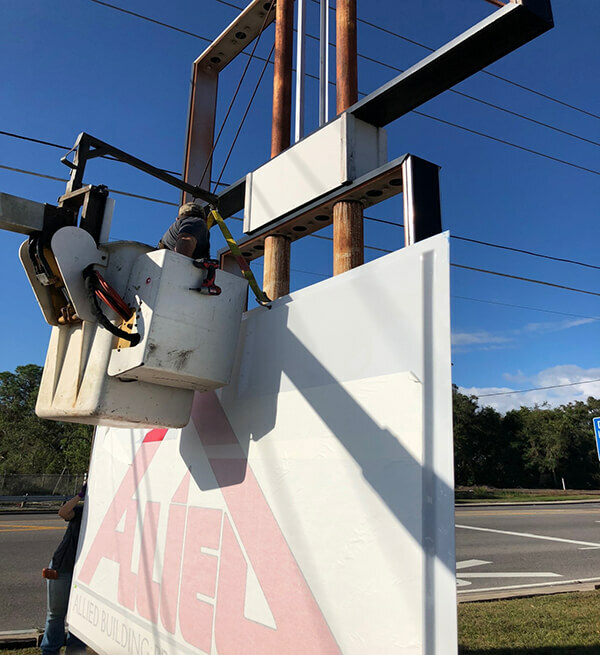 Since we have our own equipment, bucket trucks, and specially-trained installation crew for exterior signage in Florida, we sent the newly created pan face to the site for installation with a bucket truck. 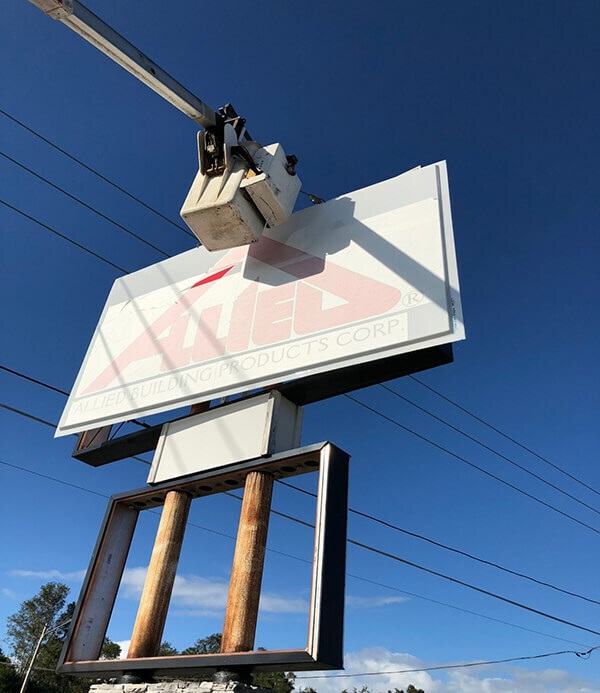 Thanks to the expertise of our installation crew, we were able to install the new exterior signage of Allied Building Products Corp. to the existing pylon frame with ease, speed and efficiency.